TeaCP/IP. surely the best Automated Home article title ever eh, get it, huh? OK, never mind. Two Automated Home readers have set about hacking the Wi-Fi water boiler from iKettle with some pretty cool results. After lots of port scanning, packet sniffing and general neck bearded geekery they have both published their findings. Check out the details and the links below which should allow you to integrate the WiFi iKettle into your own home automation setup too. …through a port scan we found out you can actually see all the commands that are being sent to the kettle from the app on TCP/IP port 2000. The kettle also sent back updates when it changed its state. To see these commands we monitored the port using the tool Wireshark when sending the commands via the smart phone. Once Philipp had worked out the protocol it was a matter of getting the team to control it with the Loxone Miniserver and integrating it with their iOS app for tablet / smartphone control. And voila! 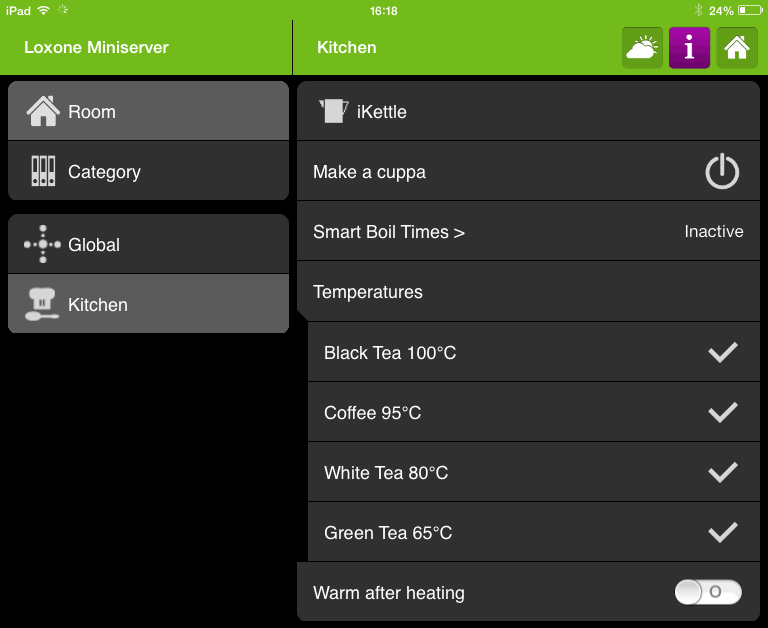 A simple user interface allows you to select your favourite temperature and make a cuppa, we also incorporated a timer so lunch time is started by the kettle boiling – a true smart kettle! In addition Mark Cox has created what he describes as a “quick-n-dirty python GUI interface” and has documented his findings and the protocol in his blog. You can download Mark’s iKettle code from the Github link below too. This protocol allows you to write your own software to control your iKettle or get notifications from it, so you can integrate it into your desktop or existing home automation system. Mark has also just compiled his app into a self contained windows exe and made it available from a link in the comment on awe.com blog page below. It’s always good to see another ‘island’ smart home component opened up for integration – take note manufacturers. Nice work guys. Be the first to comment on "TeaCP/IP – Hacking the iKettle"